Modern and comfortable hotel complex is situated in a quiet area of the city. The hotel offers 11 rooms: 1 lux, 3 half delux, 7 standard. 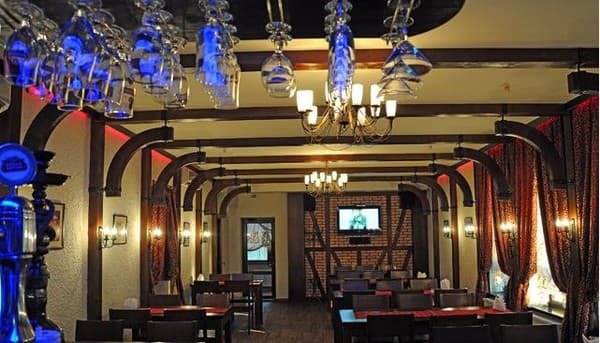 Hotel rooms meet the European standards and are equipped with all comforts: satellite TV, telephone, free Internet, air conditioner, refrigerator, bathroom, hot water. Cafe in classic European style, equipped with summer terrace, will provide an opportunity to spend a good time. 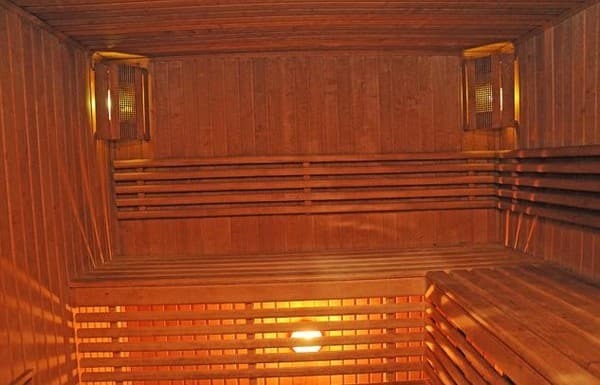 Additionally, we recommend using the services of the Finnish sauna, which is made in the original Eastern style and is equipped with light therapy, a heated pool, whirlpool, geysers, massage services. 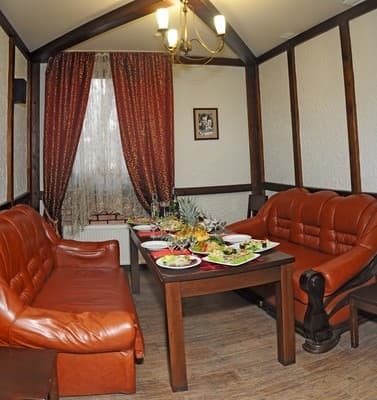 Description of the room: Standard Room - a successful combination of business style and home comfort. The room is equipped with comfortable furniture and a large bed. The rooms are individually climate system, bathroom with shower. 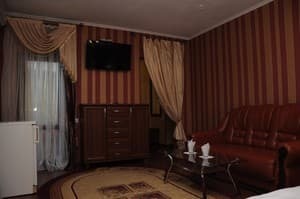 Description of the room: Room "Junior" is equipped with comfortable furniture with a wide bed, soft part, coffee table. In the room there is an individual microclimate system, a bathroom, a hairdryer, cosmetics. Also in the room there is a TV (more than 1300 channels), a mini-bar, a telephone with city and internal communication, free Wi-Fi Internet. The recreation area is in harmony with the place for work. The interior of the rooms is complemented by exquisite curtains, curtains and originally selected lamps. Each detail of the room is made in a calm and elegant atmosphere, designed to emphasize luxury and coziness. The room can accommodate up to 4 people (extra). Description of the room: The Suite has all the amenities necessary for a comfortable stay: an individual microclimate system, modern furniture design, complete bathroom equipment, hair dryer, cosmetics. The room has a soft part, a coffee table, a TV, a minibar, a safe, a telephone (city and intercom), and free Wi-Fi Internet access. The spacious balcony offers a picturesque view of the city. A cozy atmosphere and comfortable interior will provide you with comfort during your stay in the Suite. The room can accommodate up to 4 people (extra). Children under 6 have their accomodation free of charge. Every extra place - 20-50 Uah depending on the type of the room. 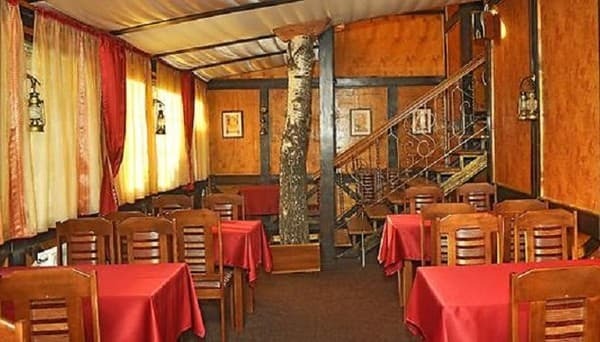 Ivano-Frankivsk region, kalush village, B. Khmelnitsky Street 18a. 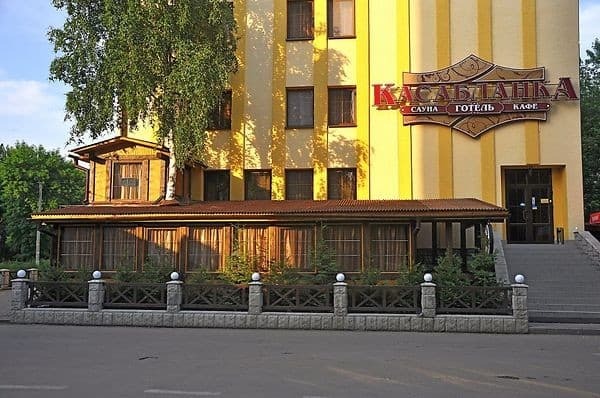 Bus: from Ivano-Frankivsk to Kalush you may get by taxi from the bus terminal, which arrives at the bus station in Pushkin street. From the bus terminal to Pushkin street to "Casablanca" in 5 min. walk. Auto: In Ivano-Frankivsk move along Pasechnaya Street to the Kaluzhsky route. Next, go straight to the main 30 km, con the way to the ring in Kalush. In Kalush move along the street. L. Ukrainian to another ring. Continue straight along the ring and go 300 m. will be a turn to the right and a pointer to "Casablanca."